Australia's railways are as diverse and fascinating as the country itself, providing as they do a fascinating array of operations, type and gauges relative to its small population base. Much of Australia's railway action takes place along its populated coastal strips, around the major coal-producing areas and on the corridors linking its major state capitals. In the major cities conventional suburban electric trains packed with commuters mingle with mile long freight trains. These contrast starkly with the giant iron ore trains operating in the remote Western Australian outback - the heaviest and longest trains in the world that serve the remote iron ore mines of Western Australia. At the other end of the spectrum a vast network of dinky 2-foot gauge railways moves up to 30 million tonnes a year of sugar cane to the mills. Despite the sparse population of the outback, rail lines cross the continent from north to south and from east to west with stainless steel streamlined passenger trains still providing long-distance tourist services such as The Ghan and The Indian Pacific. 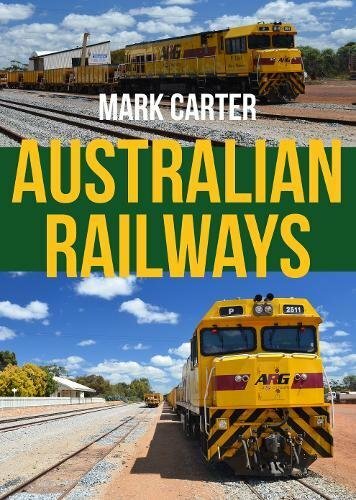 Mark Carter is an Adelaide based freelance journalist and researcher specialising in contemporary and historical transport issues, particularly rail. 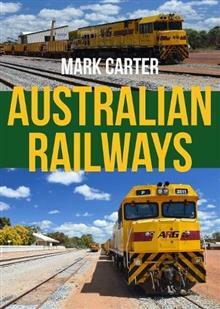 He has produced and self-published three books on Australian railways and has also been associated with the production of a number of books published by the National Railway Museum in Adelaide. He is also a keen photographer with a collection of over 50,000 images from around the world.